Katsura Imperial Villa is a famed sightseeing spot featuring beautiful Japanese gardens and traditional buildings. Many visitors to the area also stop by at this traditional Japanese confectionery shop, established about 130 years ago. The proprietors of the shop are especially particular about the quality of the red bean paste that goes into their sweets. 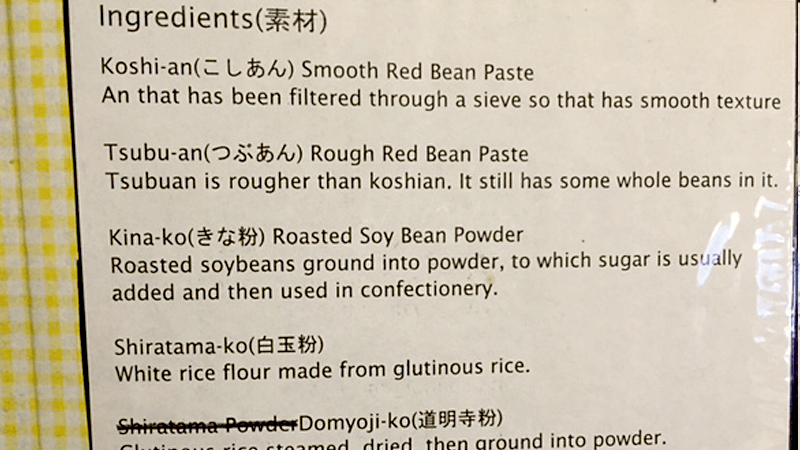 The red bean paste here is made in a traditional Japanese stove, which is an increasingly rare method in modern times. Although making the bean paste this way is much more of a time-consuming and painstaking process, it brings out a refined and delicious sweetness. We would like you to take your time to enjoy various Wagashi (Japanese Sweets) , in the surroundings of this traditional confectionery store, largely unchanged in both its decor, recipes and sweet-making methods since its establishment. Specialty menu. A generous serving of bean paste tucked inside a mochi rice cake. Kinako (roasted soybean flour) is sprinkled on top of the sweet. The chewiness of the mochi makes this sweet a filling and satisfying treat. As fresh mochi tends to harden if it is left for a while, we recommend that you enjoy this sweet as soon as possible. The brown dango is kuromitsu (brown sugar syrup) flavor, the white is plain, and the green is matcha. This sweet's charm is its satisfyingly chewy texture. A bowl of rice, topped with richly seasoned unagi. Comes with a pot of hot, fragrant, roasted green tea to pour generously over the top. Recommended for customers who would like to enjoy lunch as well as confectionery during their visit. A simple Japanese confectionery with a lightly flavored crust and a smooth red bean paste filling. A long selling item, and a favorite of many customers, this manju has been a popular mainstay since the shop's establishment. This sweet should be consumed within two days. 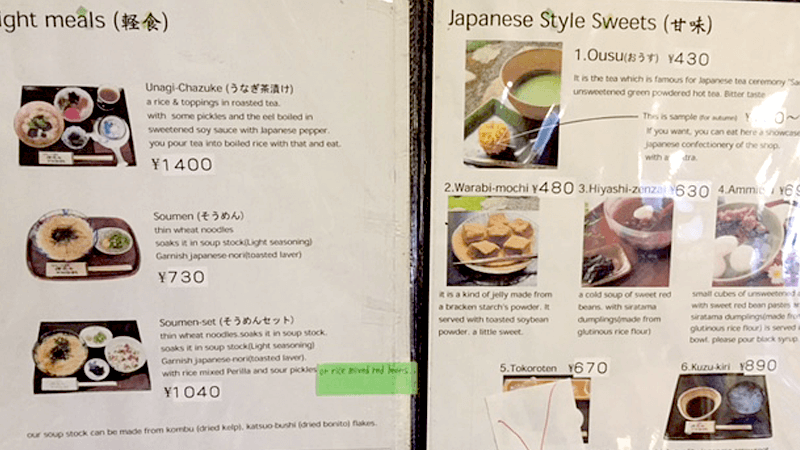 We have a booklet in English which lists some of our menu items, along with information about traditional Japanese ingredients and sweet-making methods. Menu items marked with an X are sold out. We recommend that you order a drink to go with your sweets. Please note that the sweets are fairly small in size, and you may wish to order two. You can also buy sweets in the shop to take away. We recommend this if you are not feeling full after enjoying your sweets on the premises. However, the sweets should be consumed within two days, and we recommend that you eat them as soon as possible. We recommend that you enjoy Mugite mochi and a drink during your visit. There are both Japanese traditional zashiki (tatami mat) or table seating arrangements, so please let staff know which you would prefer. Nakamuraken is a traditional Japanese sweets shop located in Katsura. In this restaurant you can enjoy Japanese sweets in a calm atmosphere sitting on a traditional tatami flooring. The mochi of this shop are really soft, but the abegawamochi with soy flour sprinkled on it just has the perfect balance between the softness and the soy flour! You can buy all kinds of mochi as souvenirs too! 11-minute walk from Hankyu katsura Station. There are often lines all day on weekends and holidays.